The Government of Yukon and the City of Whitehorse are working collaboratively to reduce the risk of wildfires in Whitehorse this spring using prescribed burning. Planned burning will take place at six locations in the Whitehorse area throughout April. To reduce risk, fire professionals will introduce fire to a landscape under specific controlled conditions and monitor the fire closely. Burn dates will depend on weather conditions and other criteria. Wildfires are an essential part of the boreal forest, but they can also be dangerous. That is why prescribed burning and other forest fuel reduction treatments are so vital to protecting our Yukon communities from wildfire. Thank you to all Yukon firefighters for helping to safeguard our homes. Prescribed burns are an effective tool in mitigating wildfires, which are a real threat to our community. Thank you to the Whitehorse Fire Department as well as the Wildland Fire Management Branch for helping us reduce the risk of potential fires around Whitehorse. 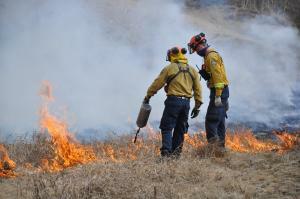 Prescribed burning occurs in areas that are susceptible to wildfire due to forest fuels such as brush and tall grass. The experience gained by firefighters from Wildland Fire Management and the Whitehorse Fire Department will strengthen our ability to suppress wildfires throughout Yukon. This will be the third year of a highly successful partnership with the City of Whitehorse Fire Department to reduce the risk of wildfire in Whitehorse. Prescribed burning is planned for over approximately 45 hectares of landscape in the Whitehorse area.